Skeletal drawing of FMNH PM24880, an old and very large specimen of Arctodus simus. Update time! (Marsh 2014) I changed the scale guy for a public domain one (I didn't realized the other wasn't) and remade the entire skeletal from scratch, rescaled everything and stuff, I've learned more about the anatomy of bears so I feel good about how the bones articulate now, one of the changes is that the ribcage is deeper now since it was too wide before although the new one is not as deep as my original versions. You might notice that I've added a "mass" there, well, I've come to make frontal and dorsal views, they don't have all the details right now so I'm not going to upload them anytime soon but they are perfectly fine to perform a GDI. August 2014 update: Removed the scale guy, I prefer a "clean" look and along with other things it made it look busy and I didn't like that. So what's new? I'm still unable to find lateral view images of Arctodus humerus/femur but I found good photos of Ursus ones so the new ones are based on them, modified with Arctodus proportions of course, I also remade the ribcage and the hands and changed the posture. New weight estimated with GDI as before but now I took into account the seasonal changes in body fat of adult male brown bears during the course of the year (18%-32%, Schwartz et al., 2014), numbers are rounded though. ¡Actualizaciones! (Marzo 2014) He cambiado el indiviuo que usaba como escala por uno en el dominio publico (no me habia dado cuenta que el anterior no lo era) y rehice toda la reconstruccion desde cero, re-escale todo y esas cosas, he aprendido mas sobre la anatomía de los osos y me siento bien respecto a como se articulan los huesos ahora, uno de los cambios es que la caja toracica es mas profunda ahora (antes era muy ancha) aunque no tan profunda como mis versiones mas antiguas. Podran notar que he añadido un"masa" ahí, pues, he hecho tambien vistas frontal y dorsal, no tienen todos los detalles así que no planeo subirlas pronto pero estan perfectamente bien para realizar un GDI. Actualización Agosto 2014: Removi al tipo escala, prefiero un aspecto "limpio" y junto con otras cosas hacia que la imagen se viera muy concurrido para mi gusto. ¿Qué hay de nuevo? Aun no encuentro fotos en vista lateral de humeros/femures de Arctodus pero encontre buenas fotos de Ursus así que los nuevos estan basados en estos, modificados con las proporciones de Arctodus por supuesto, tambien rehice la caja toracica y las manos y cambie la postura. El nuevo peso lo obtuve de la misma manera que antes (GDI) pero ahora tome en cuenta los cambios estacionales en el porcetage de grasa corporal presentes en machos adultos del oso pardo, (18%-32%, Schwartz et al., 2014) los numeros estan redondeados, por cierto. Richards, R. L, and W. D., Turnbull. 1995. Giant short-faced bear (Arctodus simus yukonensis) remains from Fulton County, Northern Indiana. Fieldiana: Geology (New Series) 30:1–34. Sorkin, B. 2006. Ecomorphology of the giant short-faced bears Agriotherium and Arctodus. Historical Biology 18:1–20. Matheus, P. E. 2003. Locomotor adaptations and ecomorphology of short-faced bears (Arctodus simus) in eastern Beringia. Occasional Papers in Earth Sciences No. 7. Will you do the Lesser Short-faced Bear (Arctodus pristinus)? Sorry for the late reply, I haven't been able to find much information of A. pristinus, save for teeth measurements. and that's about it... Shame really... I would love to do a reconstruction myself if I had the time and know how to do so. How much would the average male Arctodus simus weigh? I've seen estimates from 1,200 lbs to 1,600lbs! Perhaps that's a good range, the specimen above must have been 1,500lbs-1,700lbs, it was an old male and it doesn't seem to be of remarkable size, there are plenty of bones in Alaska and Nebraska that suggest individuals of similar size, and there are some that are decently bigger, there's an skull from Alaska 11% bigger, a femur from Indiana 11% bigger and a humerus from Nebraska 9% bigger, etc. The remains from California (Rancho La Brea, Potter Creek Cave) seem noticeably smaller, averaging a bit less than 80% the dimensions of the subject of my skeletal (so about half the weight, 700-900lbs) but maybe they are young or females as the largest ulna known (~9% bigger than in my skeletal) also comes from California. Thanks for the feedback Blaze much appreciated I was wondering what're your estimates concerning S.populators average and max weights? Atm I have its average weight at 290 kgs so close to the size of record Siberians and it's max at 410 kgs possibly more, are these good estimates? Also do you think it's possible for S.populator to achieve if not at least get close to a half ton in weight? Sorry for all the questions it's just I'd figure you'd have the answers to them since you're more knowledgeable at this sort of stuff than I am lol. Great reconstruction. It's interesting to know that the record size Polar and Brown bears can be as big as this prehistoric giant! Many thanks and yes, the sizes do overlap though I'm of the opinion of not trusting hunter claims so I'll still give the edge to Arctodus and Arctotherium but that's just my opinion. Great reconstruction. Any guesses as to what shoulder height UVP 015 might have had? Perhaps 160 - 165 cm? And to answer your question, around 166cm (assuming equal proportions to PM24880). 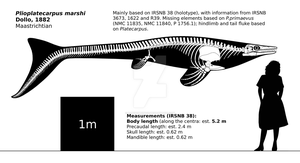 Not by a long shot, I haven't tried to articulate it bipedally but if I add up the leg, vertebral and skull measurements we can get an upper limit, I got 10ft for this particular specimen (with the head looking up to the sky), which means roughly 11ft for the largest specimens, true standing height would be a bit shorter though because when bears stand up the legs are not straight and neither is the neck. I've read about supposed claw marks 13ft up in caves, using the same method as above (but now including the forelimb instead of the neck-head) suggest that the largest specimens just barely might have been able to reach such heights with their claws. The fossils themselves of course, tv shows about or that touch some prehistory related topic commonly exaggerate, I'm confident that the skeleton presented in that show was much smaller than what they advertised it at, 14ft in standing posture would suggest an animal over 7ft tall at the shoulders on all fours, there's no fossils of bears that big. I found the episode and I recognized the supposedly 14ft tall skeleton, it's this one sold by bone clones (link) more specifically the image Monster Quest used seems to be a photo manipulation of this old promotional photomontage (link). Is it 14ft tall? bone clones advertises it at 12ft tall in the text and 10ft tall lower in the page, which one is correct? well, the data box below seems more authoritative so 10ft tall is it but just in case lets prove it using the old woman as a guide, if the skeleton is 12ft tall the woman is about 6'6''tall which is ridiculous but if the skeleton is 10ft tall, be it alone or including the base then the woman is 5'1''-5'4'', much more realistic. I was very unsure of the true size of Arctodus in till now. How much bigger (height, body mass) would be the "arctotherium yukonense" bear, the one with the 521x364mm skull? About 10% bigger, some 167cm at the shoulder and 900-1100kg. thanks! And would you say that such a bear could reach 4 meters when standing up? Nope, I have posed it to be standing up before and the largest one would get up to ~3.4m tall. Thanks for a very nice reconstruction and elaborated analysis on this titanic bear. Are the 'average' linear dimensions of limb bones from known full grown Arctotherium angustidens(which excludes MLP 35-IX-26) smaller than those of FMNH PM 24880 specimen, do you think? If so, how much shorter were they? In Pregosti's paper("Paleoecology of the large carnivore guild from the late Pleistocene of Argentina" , 2006) there are several other weight estimations for Arctotherium that are calculated to have been only 106-122kg(mean 114kg) and 102-189kg(mean 145kg), respectively. They most probably be entirely different species of the same genus, or it could still be possible that they were in fact the same single species and its weight fluctuations from individual to individual were just as wide or much greater than in extant Ursus arctos. What do you think? They are mostly smaller yes, Soibelzon & Tarantini (2009) gives measurements of 11 skulls of A. angustidens, their range was 363mm-430mm in condylobasal length, only the biggest two were longer than PM24880 (422mm) but none was as wide (319mm)*, they all are likely to be old adults because a high proportion of A. angustidens finds represent old individuals (Soibelzon, 2004a) and because skulls as "small" as 380mm (MACN 43) are considered senile adults and have heavily worn molars, when it comes to complete limb bone lengths MACN 5132 (415mm skull) is second only to MLP 35-IX-26, its humerus is 540mm long**, shorter than that of PM24880 (594mm), while its femur is 655mm long with a distal end 118mm wide, slightly longer than that of PM24880 (651mm) but is not as wide (145mm), the tibia only 365mm long, this is comparable to big brown bears and much shorter than that of PM24880 (478mm) though, there's some fragmentary remains that suggest bigger bones than those of MACN 5132 but not by much. I think both taxa have proportionally long legs and I interpret the measurements above mostly as A. simus having even longer legs proportionally than A. angustidens but yes, with the exception of a single individual no A. angustidens known appears to be much bigger than PM24880. I'm not sure if A. angustidens had such a wide weight range as Ursus arctos, mostly because its geographical range doesn't appear to be anywhere near as big and I also think that body condition also has some effect in the reported weights of brown bears, Blanchard (1987) reports a female brown bear from Yellowstone feeding on garbage dumps that weighted 182kg in september of 1977, the next year the dumps were removed and bear was monitored for 3 years, it didn't ate from garbage dumps during that period, when it was recaptured again in 1981 it only weighted 91kg, same bear, same skeleton but only half the weight. However, since findings of small individuals of A. angustidens are rare, the weights reported by Pregosti (2006) are probably for some of the smaller, more recent species, Arctotherium decreased in size throughout the Pleistocene, the youngest species, A. wingei, was not much larger than the modern spectacled bear. *The second longest at 423mm was supposedly 396mm wide but I think this is crushing or something to that effect because none of the other skulls had this kind of proportions. **The distal end of the humerus of MACN 5132 is wider still than even that of MLP 35-IX-26 according to Soibelzon & Tarantini (2009) I don't know why, it could be crushing or a typo, I've seen a low resolution photo of what appears to be the humerus in question and it doesn't look like it has that kind of proportions. Thank you, I'm very glad to have such elaborated data and analysis! 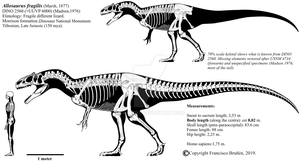 I see that the South American GSFB had similary elongated forelimbs but with slightly different proportion(especislly tibia) from that of the North American cousins. Soibelzon's particular South American GSFB specimen seems to be a good deal larger than other known adult specimens and thus may not be treated as average but differences in comparison with the North American PM24880 are not as great as people tend to believe. Considering that the width of the distal femur of some A.angustidens specimen is much less than in PM24880, it may be that robustcity of these two species were not much different either? Still, these short faced bears were indeed massive animals and I'm looking foreword to your weight analysis on them. What is your policy as far as the usage of your skeletals for artistic reconstructions? *sorry for replying so late. I don't mind at all as long as you give credit, which you did. I'm making some changes to it, changes to the neck vertebrae, the feet and posture, and also adding the intervertebral cartilage that I totally forgot in the last update haha. Amazing work, and excellent analysis. Keep this up and you may eventually get almost as good as ! I really don't thinks so but thanks for the compliment haha. though, I'm currently correcting some mistakes that passed me by originally haha.